All transactions are safe and secure with a reliable history in online purchasing behind each of our associates. Buy the Vintage G.I. 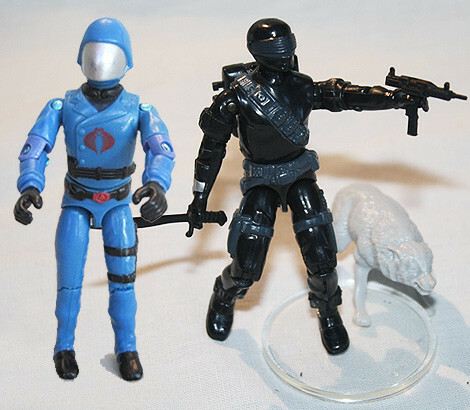 Joe Action Figures and Toys to own G.I. Joe clothing and merchandise. If you are a male who grew up in the 1980s and someone asks you what was your favorite childhood toy, one of the first things that you likely think of is G.I. Joe figures. These vintage toys were more than just plastic characters with bendable joints, they were 3 3/4-inch tall soldiers that transformed our bedrooms into epic battlefields where heroes fell, villains rose and good eventually triumphed over evil. Reenlist your favorite characters with a collection of vintage G.I. Joe action figures and toys. In addition to the Vintage G.I. Joe Action Figures and Toys above, browse the G.I. Joe Clothing Gallery for more apparel like men's and women's clothes, kids shirts or hoodies.